The 120 VAC CITC Haze-Max Dream Team includes a Haze-Max with DMX on board, a three-speed Director Fan, a DMX FX-15 Switchpack for the Director Fan, 16 gallons of glycol-free Water Vapor Haze Fluid, safety cables, a C-clamp, and a double C-clamp. Note: Use only CITC's Water-Vapor Haze or Organic fluids for warranty coverage. Use of other fluids will void the warranty. 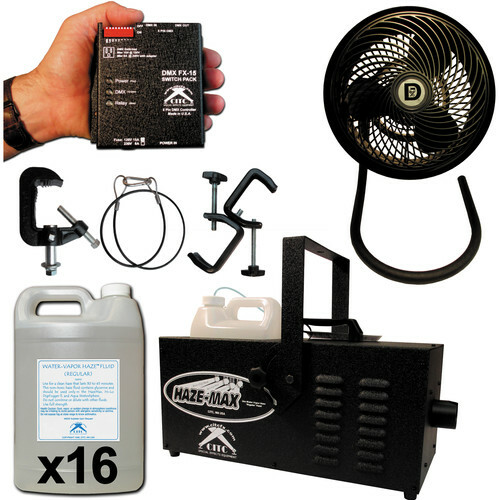 The CITC 120 VAC Haze-Max with DMX is a professional, easy-to-use, reliable haze machine that produces a long-lasting, 30-minute, even haze from a water-based fluid without using any glycols or oils. 1 gallon of fluid can last up to 2 hours, depending on the timing and output selected. The Haze-Max delivers a thick, white output of 15,000 ft3/minute of digitally controlled haze. It features a quiet pump with a 1500W heating head, a 25' (7.62m) remote control, and a single channel of DMX via 5-pin XLR. With no condensation or residue, this Haze-Max machine works on professional stages without clogging. This machine requires no programming or special care, only a 5 minute warm-up, and there is no need to change the heads. This Haze-Max with DMX continues to do its job for 10 years and continues to function. It comes with a hanging bracket, so you can hang it and use it right away. The black 120 VAC Director Fan from CITC quietly focuses fog, wind, and bubbles, up to 70.0‘ (21.5m) away in a direct line without spreading. This unit pushes liquid snowflakes, petals, confetti, and more from 30 to 40' (10 to 12m). The channeled vortex action allows precise targeting to the subject, making the Director Fans suitable for theater, concerts, video, and photography. The Director can be hung with a double c-clamp. Box Dimensions (LxWxH) 25.0 x 18.7 x 18.3"